Cleckheaton's Qaiser Ashraf takes a liking to the Woodlands bowling during his innings of 20 not out in last Saturday's Bradford Premier League derby clash. BATLEY GAVE their hopes of survival in the All Rounder Bradford Premier League a real boost when they earned a 29-run win over Townville last Saturday. 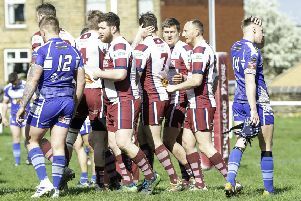 Victory saw Batley move off the foot of the table, above Pudsey Congs, and they are now just six points behind Cleckheaton, who have slipped to third-bottom. Batley appeared in real trouble when they were reduced to 104-7, with Jack Hughes claiming 5-15. Number 10 batsman Naik Zada produced a key innings with an unbeaten 44 and shared a crucial 56-run stand with Tariq Hussain (21) that enabled them to post a much healthier total of 180 all out. Hughes followed up with 45 but Townville were bowled out for 151 with Tariq Hussain taking 4-38 and Mohammed Hafeez 3-33 to leave Connor Harvey stranded on 25 not out. Hanging Heaton ended Bradford & Bingley’s eight-match unbeaten run to consolidate their eight point lead at the top of the Premier Division. Paceman Tom Chippendale was the key man in Heaton’s ninth win of the season, claiming the first six Bingley wickets to fall in figures of 6-37 as the visitors were bowled out for 124, with David Clow (38) the only batsman to make an impression. Opener Nick Connolly continued his rich vein of form with 64, which took his aggregate for the season to 777. Connolly was joined in a second-wicket stand of 103 with Richard Foster who finished 40 not out. Champions Pudsey St Lawrence secured a superb 10-wicket win over Lightcliffe as both their openers made centuries. Lightcliffe had managed to post 262 all out when they batted first. Captain Matt Baxter struck eight fours and five sixes in a top score of 91, with support coming from overseas man Kashif Naveed (77). Oliver Ashford (5-41) and Richie Lamb (3-81) impressed with the ball. However, the Lightcliffe bowlers had no answer to Mark Robertshaw and Adam Waite who both hit centuries to power Lawrence to victory. Robertshaw made 126no and Waite 122no in sharing an unbroken stand of 266. Robertshaw hit a six and 15 fours while Waite struck six sixes and ten fours. St Lawrence passed Lightcliffe’s 262 with 2.2 overs to spare and they are fourth in the table 18 points off the pace.